The Remains of the Day is set in the 1950s and deals with the changing world of a man who had totally dedicated himself to being the best English butler he can be. Yes, picture that upright, serious, effective, totally dedicated, courteous, loyal gentlemen butler that we are used to seeing in period drama movies. The mini-series Downton Abbey hinted at the changing world for people who worked in service but never quite made it to the time when a butler would no longer be needed at all, which is what is happening in this book. With the permission of his new American employer, butler Stevens sets out on a road trip to meet with a former female colleague whom we believe he loved although he may not know that fact. The road trip gives Stevens (and us) plenty of time to reflect back on his choices over the years and to ponder whether or not he made the right ones. Author Kazuo Ishiguro meant the book to be a metaphor, representing most of us who labour through life in one way or another and do not really know what the outcome of our efforts will be. A few members of my book club really enjoyed reading The Remains of the Day. However, it was not a page turner and I was slow to warm up to it but in the end I did enjoy it. It was interesting and thought provoking and I would recommend it for anyone who enjoys period drama movies and historical fiction but not because of how those books flow but because of their subject matter. By way of further recommendation, you should know that Remains of the Day won the Man Booker Prize in 1989 and that it is a very highly regarded post-war British story that sits at number 146 on Stanford University’s list of the best twentieth-century English novels. I came away thinking that one should live for today and not let life pass you by. Stevens gave up too much in his pursuit of excellence and in the end wound up with nothing. 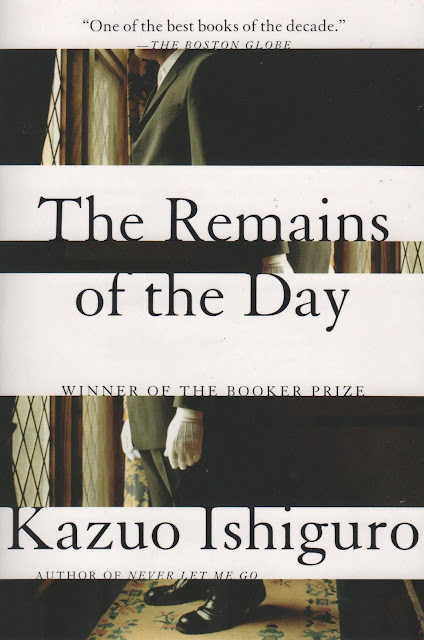 I will be watching the 1993 movie version of The Remains of the Day, which was more familiar to me than the book before it was added to our book club reading list. The movie stars Anthony Hopkins and Emma Thompson and was nominated for eight Academy Awards and sounds like a worthy follow up to this novel. How about you? Will you be reading or watching The Remains of the Day? Or perhaps you have already done so? If you have not yet read the book and are interested, you can find your copy on Amazon by clicking right here. Order your copy of The Remains of the Day from Amazon. Another interesting sounding book. Your book club finds some fascinating books to read, Brenda, and I'm delighted you review many for us or I might have missed them entirely. Another fascinating book review. This isn't a topic that I'd seek out, but the lessons that you took away from reading The Remains of the Day make me interested in taking on the book to learn more. I have seen the movie but I have not read the book. Now, I think I should also read the book. I usually prefer the book because they generally will go into greater depth and fill out the characters better for me. I like feeling like I have actually meet the people in books. It does sound like an interesting book. I just may read it next time I'm looking for a book to read. I haven't seen the movie, either. Thanks for visiting, all. I am looking forward to the movie, too.